Ceramic disk, Denghoog monument, Sylt, Germany. Flat ceramic disks were found as votive deposits in TRB monuments and flat graves (Flat grave of Issendorf). Perforated Ceramic disk, Denghoog monument, Sylt, Germany. 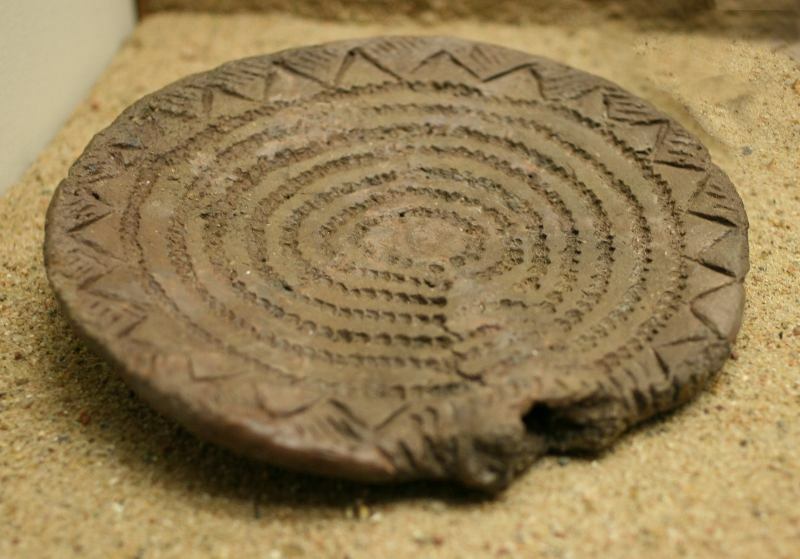 Flat ceramic disks are also found in other cultures (Michelsberg, Globular Amphora culture). 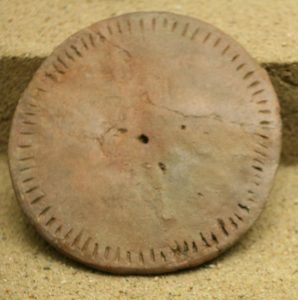 The disks are often interpreted as bread baking plate. In the passage grave Denghoog on Sylt, Germany a number of votive offerings were found. Amongst them were perforated and decorated flat disks (see figures), about 15cm in diameter. The decorated disk has a hole on the side to be mounted on a stick.